Tory in-fighting over Brexit is a common theme in this week's Sunday papers. The Sunday Times says Theresa May's cabinet is close to collapse over what to do next. The prime minister's aides, it says, are at loggerheads over whether to accept a soft Brexit - if backed by Parliament in Monday's "indicative votes" - or call a general election this week. According to the Mail on Sunday, the decision about whether to trigger an election has plunged Downing Street "into civil war". A poll for the paper gives the Labour leader Jeremy Corbyn a five-point lead over the Conservatives - leading the paper's pollster to say that a snap election would be a 'kamikaze' move by Mrs May. The Foreign Office minister, Alan Duncan, has told the Observer that a general election before Brexit is resolved "would only make things worse". The Sunday Telegraph says that senior ministers have virtually given up any hope of the Democratic Unionist Party supporting Mrs May's deal, which means she faces a growing likelihood that Parliament will force her into seeking a soft Brexit, if backbenchers can agree a plan. The Sunday Mirror argues that a permanent customs union is the best way forward. But the Sunday Express says this will keep the UK trapped under Brussels' rule permanently - without a say. MPs, it says, have to leave Wonderland and start facing reality. The Sun on Sunday warns that Brexiteers are in danger of losing everything they have fought for. 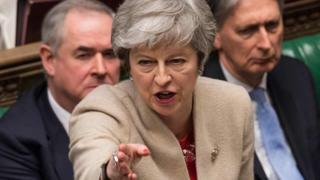 It says a fourth defeat in the Commons for Mrs May's deal will have devastating consequences and it accuses Tory MPs such as Priti Patel, Owen Paterson, Sir Bernard Jenkin and Suella Braverman of being prepared to play "Russian roulette with the future of the country" rather than ditch what it calls their ideological purity. Who will be the next Tory leader? As many papers speculate about who will join the race to replace Mrs May as prime minister - Boris Johnson, Michael Gove, Sajid Javid and Andrea Leadsom are just some of those named - former Brexit Secretary Dominic Raab sets out his pitch for tackling knife crime in a piece for the Sunday Telegraph. He says he would use tough and targeted law enforcement - including increased use of stop and search - with a commitment to prevention within communities. Cabinet minister Liz Truss tells The Sunday Times if she were leader she would use money saved by Brexit to fund tax cuts for businesses and young people, while Justine Greening tells the paper she would be tempted to enter the race to ensure the Tories bring a modern approach and equality of opportunity. The Mail on Sunday is one of several papers to report the postponement of the Rolling Stones US tour because Sir Mick Jagger needs urgent medical treatment. The Sunday People says the news is a shock as Sir Mick's fitness regime of three hours a day, six days a week has kept him rocking into his 70s. Trawlermen in Greece are being paid 200 euros a month to recycle rubbish caught in their nets, The Observer reports. The scheme aims to include 100 boats by next year. But the man behind it admits to the paper it's funded by a philanthropic foundation and is only holding back global marine pollution by a minute. "There are days", he says, "when we find more plastic than fish". Research, reported in the Mail on Sunday, predicts almost half of all teenagers will never marry. Figures obtained from the Office for National Statistics by the Marriage Foundation think-tank also reveal that rates of marriage among the under 25s have fallen to 8% and 4% of men, compared with 81% and 62% respectively in 1970. Classic car drivers have been enjoying free parking at supermarkets and railway stations, according to the Sunday Telegraph, as automatic number plate recognition software is unable to register vintage licence plates. But it's not all good news the paper says - some drivers have reported being stuck in car parks that still have barriers as they have not been able to pay for a ticket to get out. Aristocratic secrets will be laid bare, The Observer reports, with the purchase by the British library of the personal papers of the Granville family. The previously censored private correspondence, seen by the paper, include a candid letter written in 1809 to Harriet Granville - the daughter of the famed Georgiana, Duchess of Devonshire. In it her aunt informs the young woman that her new husband is the aunt's former lover and father of her two illegitimate children.